I drove the 72 sprint to the annual Sully Plantation antique car show. The class is all 67-73 Mustangs and there were four cars. A real nice maroon 69 Mach1 (1st), a blue 67 conv (2nd) and a 73 Boss 351 took third??? He was shocked to take 3rd place with this dark blue/silver 73 Mach1 (with Boss graphics) and as he described had a paint job that looks like a five year old did it. In the pictures it looks pretty nice and I talked to the owner who wasn't even going to enter it but it goes to show don't assume anything when it comes to judged shows. I think my Mach1 may have fared better since it has paint job that is half as old as the sprint and the engine compartment has been repainted. He should have had points deducted for wrong graphics! Yeah, I never plan on winning anything! There is always someone with more money waiting to take the trophy...LOL! If you build your car for trophies ,imo, you built it for the wrong reasons. But they are a nice bennifit when you do get one. I can promise you his ride home was no better than yours. Most of those shows are popular vote. If the owner knows everyone there, a POS can beat all others. TNfastbk said it right - trophies are not everything. I have seen 'cheater' cars beat really nice ones too many times. It was a judged show but I doubt the judges would have known a Boss from a Mach1. Anyway, I got docked for my "old" Mustang with 39 years worth of nicks and what not. The guy bought the 73 seven months ago via the Internet and I could see up close what he was talking about - the paint had a lot of debris in it like someone decided to turn on a fan on the garage floor while the paint was still wet. Anyway, I assume it was "restored" recently as the paint was shiny and it looked pretty ood under the hood. Of course in a show where authenticity mattered it would have lost points for the obvious deviations from stock. Oh well, if my buddy with his rarely driven pristine 73 Mach1 showed up he would have he would have cleaned both our clocks. Boss1Ray;27487 Wrote: Most of those shows are popular vote. If the owner knows everyone there, a POS can beat all others. TNfastbk said it right - trophies are not everything. I have seen 'cheater' cars beat really nice ones too many times. It seems that the comments you get from the spectators at the shows are usually a lot more positive than the votes received from the popular vote from the other car owners. I had one guy tell me he votes for the worst looking cars there so his will fair better in the votes. I have entered my 89 GT a lot of Mustang shows over the years and gotten my shear of 2nd and 3rd places. But if you don't belong to the club your not going to get 1st. The club members vote for each other. Triostang;27419 Wrote: He should have had points deducted for wrong graphics! 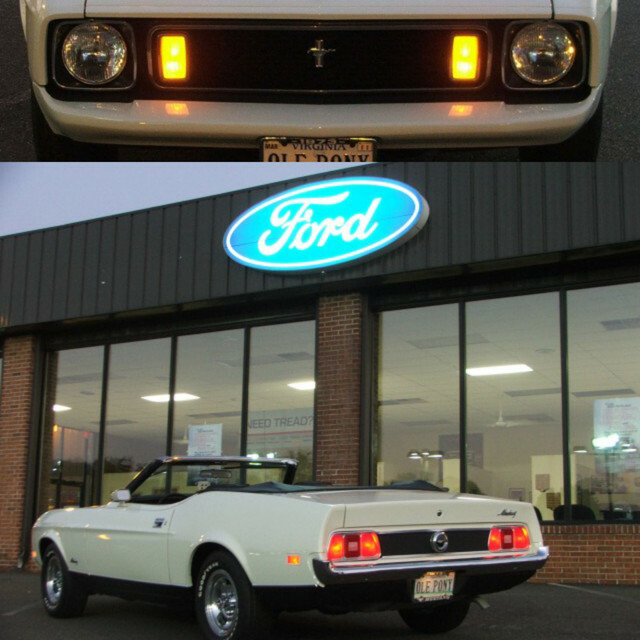 And maybe also the fact that there's no such thing as a "1973 Boss 351?" I know I almost feel bad when my 1980 Jeep CJ-7 wins in its class at our local car shows over much more deserving cars. But, it's all about the presentation and voting. Nobody's ever seen a Jeep like mine before, so I'm sure I get more points for 'unique' than anything. My Jeep ain't all that... trust me... but 7 years and 4 trophies tells a story, I suppose. I certainly couldn't win concours. Oh well, I bet you showed up to have fun. And who wants to have another trophey they have to dust? ?